Camouflaged among cactus and yucca just north of Barstow, CA, the United States Army operates its National Training Center at Fort Irwin on a sprawling chunk of desert larger than the state of Rhode Island. The Army has used this land since the 1940s as a full-scale infrastructural model for the simulation of modern warfare. Nearly all U.S. troops spend a twenty-one day rotation at the NTC, where recruits and Berets alike role-play in the conditions of war overseas. On June 15, my partner Ian and I woke up at six and drove blearily east on the I-15 from Los Angeles, then turned north into the Mojave. A single access road cut through thirty miles of bluish mountains and the scrub of high desert. We wondered whether the painted rocks were an actual geologic feature, and, if so, whether we would find them amid an entire desert of similar specimens. I imagined plastic rocks, fakes, the kind that cover unsightly plumbing—but near the road’s terminus an unmistakable boulder pile loomed into view, covered in the painted logos and mascots of dozens of battalions, companies, and brigades; artifacts of Fort Irwin’s ongoing, staged war sprayed onto the land. Several rowdy Army fans from Oklahoma milled around snapping photographs. A calm, elderly Korean man from Pasadena stood near a married couple—both, I would later find out, incoming military nurses to the base. Tammy, a military spouse and one of our two volunteer tour leaders, arrived late. She asked that I change clothes, explaining “no shoulders or legs allowed.” I went back to the car and put on Ian’s work pants. I am a small person and felt engulfed in his very tall jeans. Our group then loaded onto a spotless white no-name monster bus with gigantic desert tires, and rumbled towards the base. Inside, in a neutral screening theater with grey walls, Tammy hit play on a three-part briefing video, ostensibly to outline the differences between the reality and the myth of the National Training Center. It was a music video. Take that seriously: a music video, to delineate the difference between myth and reality, is how the NTC represents itself to the outside world… Music video, the mimetic choreography which we civilians use to turn reality into myth or to make the myth of celebrity feel like part of our own normal state, a form of magical access to idols and spirits. The first film, titled The Game of the Past, began with old footage of tanks rumbling around in the desert, a “force-on-force” simulation of conventional warfare during WW2, the Korean War, and the Cold War. The nostalgia piece was then embarrassed by the slick realness of The Game of the Present, a panning montage that showcased modern Irwin’s fake Middle Eastern towns, populated by real Middle Easterners who play lightly fictitious versions of themselves. 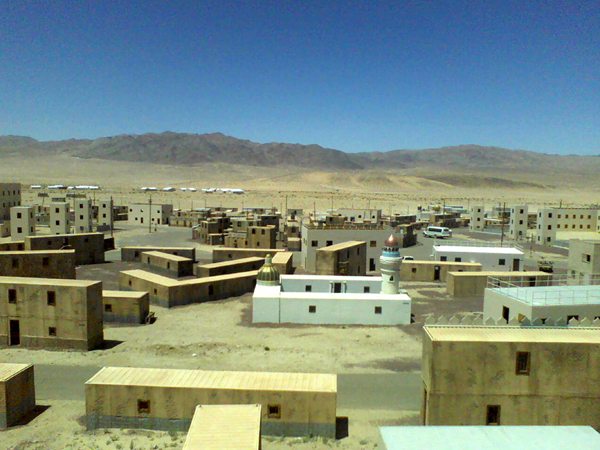 The Game of the Present also offered a brief portrait of the 3,000 military personnel who support the facade of the base, complete with live ammunition, laser-tag vests, modern tanks, transport vehicles, explosions, townspeople, soldiers, goats and buildings, featuring the usual chunky soundtrack. During a brief intermission I asked whether private security firms have also visited the base. The question hung in the air unanswered until The Game of the Future kicked off in a juicy pump-up, set to the Matchbox 20 song "How Far We've Come." So how far has the NTC’s fictional scenario come? Today, Fort Irwin is half Hollywood, half Vegas. The fort’s pyrotechnics engineer worked on Waterworld and a commanding officer proudly described Brad Pitt's "research visit" for an upcoming film. The Game of the Present had been excerpted from Full Battle Rattle, a feature made in 2008 by independent filmmakers Tony Gerber and Jesse Moss (now available on Netflix). According to their directors’ notes, Gerber and Moss—who describe themselves as anti-war filmmakers—embedded within a simulation in 2006, during which time they mimicked “real” war journalism. In order to control the role-play as much as possible, the Army owns everything, even the air. Restrictions allow no American cellular interference, no bothersome cluttered electromagnetic field, no civilian airspace. Simulations can include GPS jamming or complete radio silence. The Army owns the mineral rights as well: they’ve carved out a network of tunnels and caves from which to flush role-playing insurgents, some 120 troops from the 11th “Blackhorse” Armored Cavalry Regiment, which has provided opposition in mechanized desert warfare training since 1994. Some of the 11th’s other squadrons have been deployed to the Middle East, but the role-playing squadron (the 2nd) is considered to be one of the best trained mechanized forces in the world. According to our guides, soldiers here envy the role of Afghan rebels. The 2nd Squadron receives specialized training (for example, in building Improvised Explosive Devices) and are held to relaxed grooming standards. Tammy described their simple mission, to “stay alive and wreak havoc.” The incentive to evade their American opponents is strong: if they “die” during a NTC simulation, insurgents must shave and go back on detail at the base. A beard therefore indicates a Blackhorse soldier’s level of effective participation within an elite cadre. The Army also owns the ground on which its members fight, a vast area that includes at least thirteen simulated towns with tunnel and caves, as well as live fire ranges and tank battle arenas. The current setup was originally designed to represent Iraq though, at the time of my visit, the land was officially declared to be Afghanistan. It could easily become Syria. In his seminal essay “Mimicry and Legendary Psychasthenia,” the French botanist and linguistic theorist Roger Caillois describes the way one phenomenon copies another, positing that "mimicry would thus be accurately defined as an incantation fixed at its culminating point and having caught the sorcerer in his own trap." Fort Irwin may host the world’s largest simulation game—an instantiation of megaplex bio-mimicry. A tourist seeking to experience this game can also seek to hold it in their imagination as yet another abstraction of the reality which it seeks to engage, because Irwin exists on a sliding scale between what we call real and what we call artificial or imaginary or magical. Experiencing this sliding scale is complicated by our cultural desire to perceive the distinctions between those various states. We assume that “real” and “artificial” exist as values in opposition. Out of our demand for resolution, we describe ourselves as different and distinct from our surroundings, neglectful of our repeated acts as a form of transformative incantation. Think of Tammy the tour guide, forever mouthing the word magic as she passes through Fort Irwin’s gates. Her use of that phrase, “where the magic happens,” is the precise reason that I wanted to see the National Training Center. But, returning to Callois, my question is whether a disguised insect is in control of or held in thrall by its relationship with the leaf that it so closely resembles. Or, are the insect and leaf actively converging? The Painted Rocks, the Star Wars building, and the entire National Training Center are all real phenomena that have been stretched over a skin of alternative reality—like EPCOT, or George W. Bush spending his post-Presidential years painting inoffensive self-portraits, or the Mars Desert Research Station, quietly role-playing the conditions of life on another planet without shouting distance of the Biosphere. These are descriptions of disruptions, places in space and time where unselfconsciously mimetic behaviors produce a multi-tiered feedback loop, within which we struggle to articulate who, and what, we actually might be. 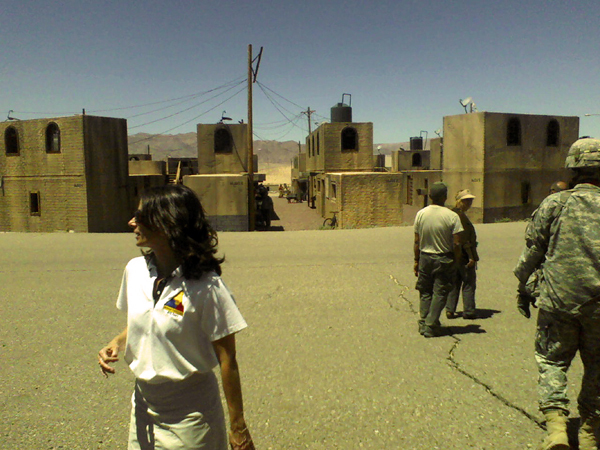 The officers led us down to the market, where buildings were the size and shape of shipping containers (although apparently in other parts of the Box, new construction follows Iraqi building standards). 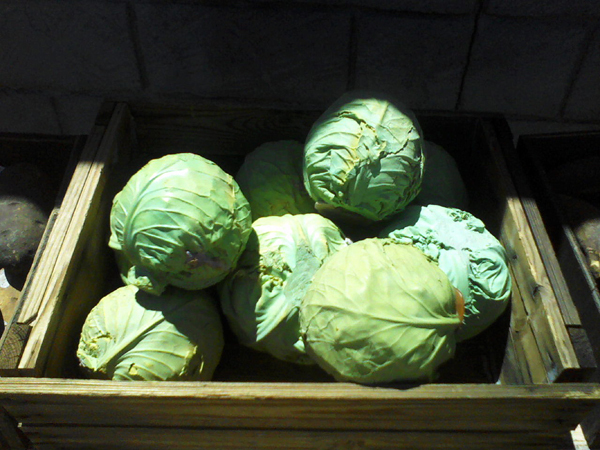 More townspeople appeared out of these, carrying plastic cabbages, melons, meat on skewers, bagels, all of which they tried to sell to us. 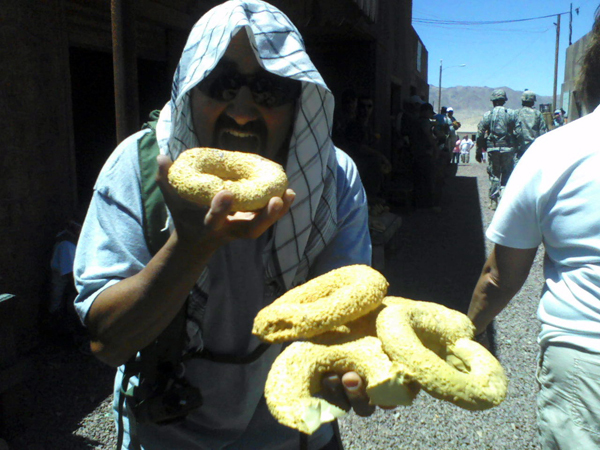 I could not help myself from haggling and there was a friendly, mild level of humiliation for everyone. I told one man that his plastic eggs didn't look fresh. I tried to buy a teapot. The Waterworld pyrotechnics guy introduced himself and invited us up to the second story of a building. "I want you to meet Eddie,” he said. "Get out here, Eddie!" Eddie was white man with a bandanna and a thick beard. He was wearing what looked like a bomb strapped to a vest. Waterworld Guy explained that in this scenario, “Eddie's role is to fake an injury and get into the American medic tent. When there's a high density of top brass or valuable medics, Eddie will blow the vest. Let's give Eddie a countdown!" Everyone joined in. "Three, two, one!" Eddie extended his arms, threw back his head, and howled, "ALLAH AKBAR!!" Nothing happened. He was visibly confused, disappointed, fiddled with the fuse. Nothing. Waterworld Guy walked over and jangled some wires on his explosive vest. He looked at Eddie and then over at our tour. "Aw, Eddie, too bad,” he said, “another day, right?" Anna Ialeggio is an artist and builder from Vermont, presently based in Los Angeles, and triangulating the center of a Shire/Mordor complex.